One of the things I’ve learned through the years is that there is no single panacea for anything. In the line of research I do (comparative public policy), I always find that there are so many different ways of getting governments and individuals to do things and achieve certain goals that there is no single public policy instrument to solve all society’s ailments. The same is true of academic writing. By now, I have read probably a dozen or so books on how to improve scholarly prose, and how to produce better text at a faster rate. I’ve pored over workbooks, short volumes and reference texts in order to find That Magical Piece of Advice on How To Publish More, Higher, and Better. You can find several blog posts that summarize my Reading Notes of each one of these books, under my Resources website tab. The truth is that panacea, information that will make books automagically appear DOES NOT EXIST. At the very least, it does NOT exist in the form we would like it to exist. 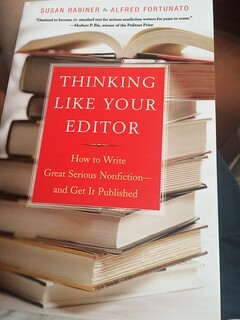 One of the books I’ve recently acquired, and I did so because I have a few books on the go (as in, writing, completing, finishing up), is the Rabiner and Fortunato volume “Thinking Like Your Editor: How to Write Great Serious Non-Fiction and Get It Published.“. There are a number of books for when you want to publish a scholarly book (like William Germano’s Getting It Published), when you want to edit your doctoral dissertation to make it into a university press or scholarly, more general book (like Germano’s From Dissertation to Book), but Rabiner and Fortunato’s volume is specifically for academic trade books. It’s important to decide which one you want to write (or when revising your dissertation to become a book, which book you want to produce). I really enjoyed that Rabiner and Fortunato showcase acquisitions editors’ thinking and decision-making processes. For anyone who wants to write a book proposal, having the answers (and good responses, specifically!) to The Big Five is fundamental. Something I noted in a Twitter thread on publishing I posted a couple of weeks ago that Rabiner and Fortunato make clear: your book proposal should tell what’s different. How does your book change our thinking about something? Why are previous treatments of the subject insufficient to provide a fuller picture? One of the best ways to learn how to write the answers to these questions is, as I’ve noted in this thread, to read book introductions. As I’ve noted in earlier threads, you should read A TON of book introductions to see the stylistic manoeuvring that comes with showing a gap. For example, as I noted on Twitter, this would be a way to write about how a book on subnational Mexican water laws improves our understanding of water governance above and beyond what we already know. “Gomez and Gonzalez showcase how Mexican water laws evolved. However, their analysis lacked subnational comparisons, which I do here”. As I noted on Twitter, I love that Rabiner & Fortunato provide so many concrete examples that they work the reader and prospective author through, asking them “now, YOU go and do it“. Academic writers need LOTS of examples, and at least I can say I learn better when shown how I should be doing things. Something disappointing from books about academic writing, as I noted on Twitter and here too, is that there isn’t a book about How To Write A Book. They all compress lessons. "Oh and by the way here's one or two chapters on issues that will come up with your writing". That's why these books all have a market. I will give Rabiner and Fortunato credit for providing 3 chapters on writing the book though Ch 7 is the most process-oriented of them all. I was also impressed by the abundance of examples and walk-throughs that Rabiner and Fortunato offer. For me the most impressive of them all was their Full Sample Submission Package. Germano does this too, in both of his books, but I found Rabiner and Fortunato’s submission package really useful to think about mine. Truth be told, I am beginning to understand why the market for books on academic and non-fiction (and fiction!) writing keep getting sold. There’s always SOMETHING that you can learn from each one. In this case, I learned A LOT from Rabiner and Fortunato for the kind of books I want to publish later in my career (academic trade books). Definitely worth reading. Tagged with academia, academic writing, book writing, reading notes, writing.